Welcome back! 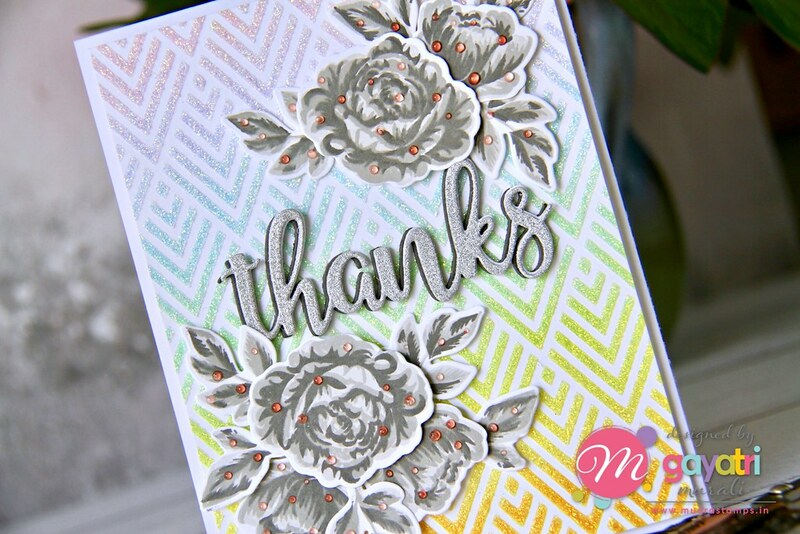 I have a thanks card to share using Mudra stamps and stencil. 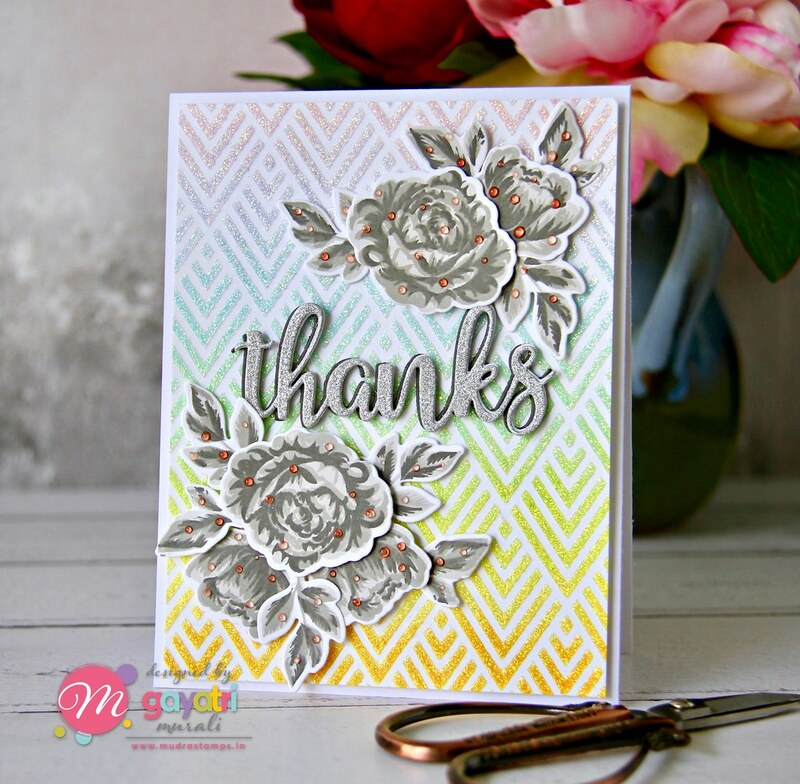 I used Mudra’s Deco pattern stencil to create the background. I sponged distress inks on the stencil first. The colours I used are Spun Sugar, Milled Lavender, Tumbled Glass, Cracked Pistachio, Twisted Citron and Squeezed Lemonade and Dried Marigold. Then I added Moonstone glimmer paste over the ink sponged stencil. The Moonstone glimmer paste is clear sparkle paste. So the colours behind the paste shows through once the paste dried leaving a gorgeous background with sparkle. I trimmed the panel and adhered to the card base using foam adhesive. For the sentiment, I used the Thanks Die. I die cut three out of grey card stock and one out of silver glitter cardstock. 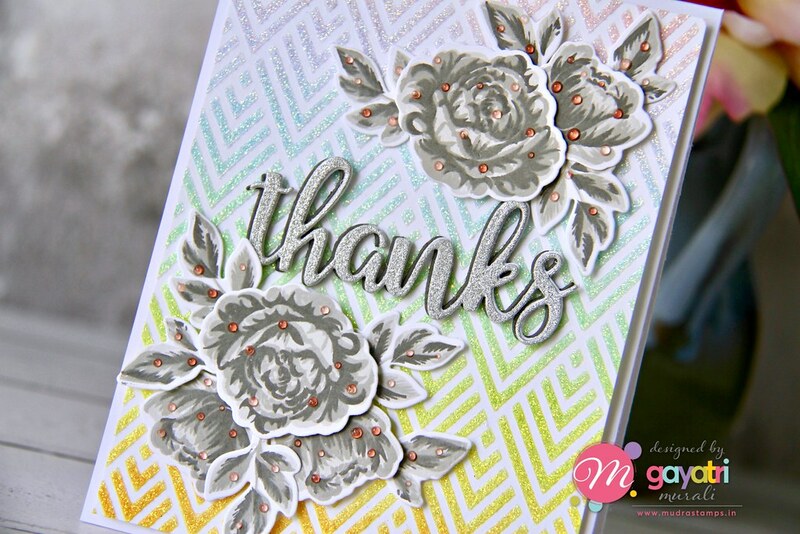 I stacked glued them all with the silver glitter die cut slightly offset the grey to give shadow effect. 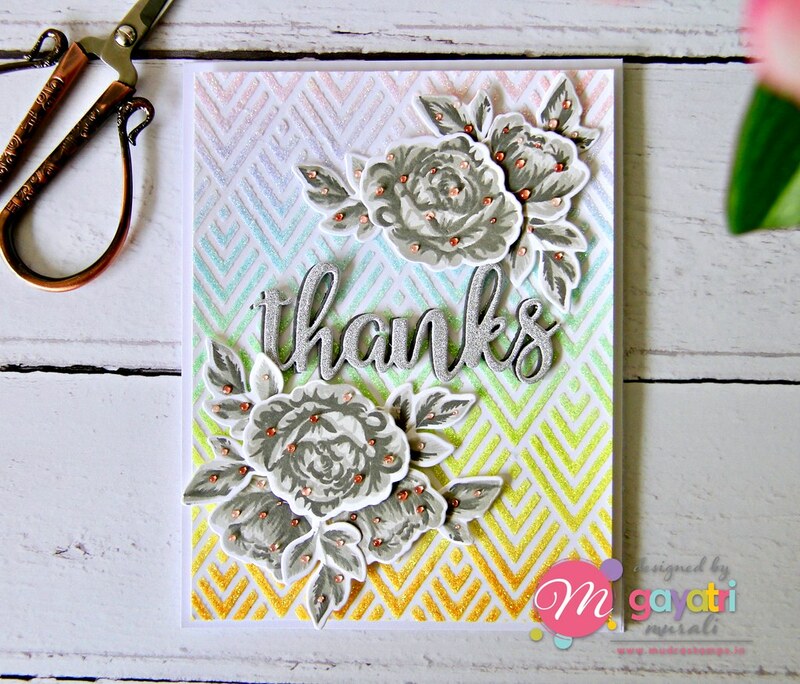 To frame the sentiment, I used the Botanical Blooms stamp set and coordinating dies. 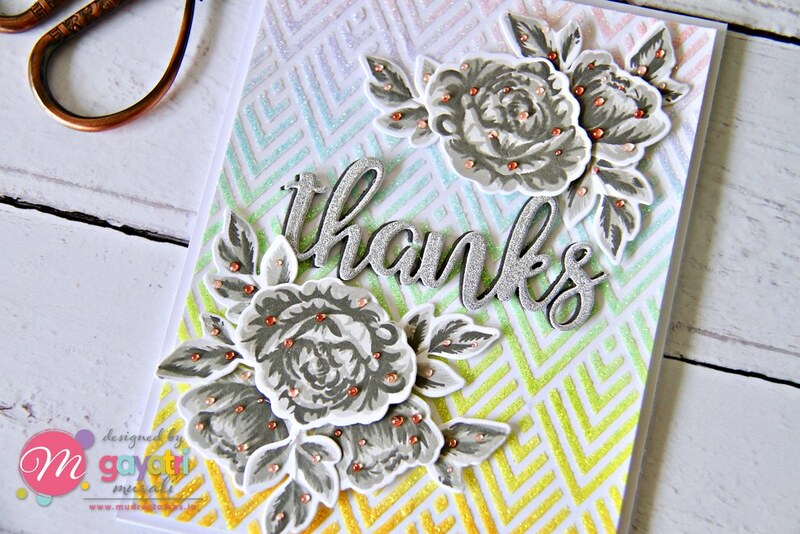 I stamped the flowers and leaves in monochromatic grey using Altenew’s Rock Collection ink set. I chose the grey monochromatic flowers and leaves because the background is already colourful and gorgeous. By using colour on the flowers and leaves, it will compete with the background. I clustered glued a few flowers and leaves to make two small clusters. I adhered one on top of the sentiment and one on the bottom diagonally. This frames the sentiment. Then I added a few glossy accents as dew drops on the flowers. I have no idea, how they became red! I swear I only added glossy accent. Anyway, I felt it looked cool! So that is it. That is the card for today. Hope you like it. This is so beautiful!! 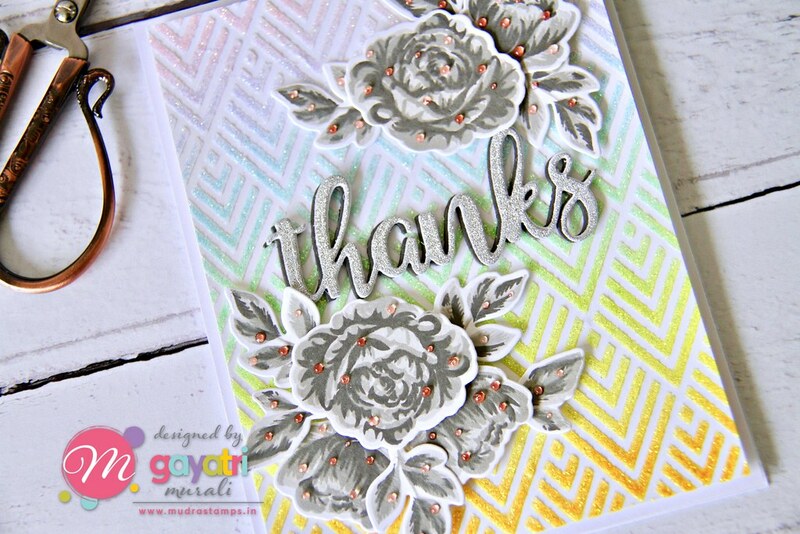 Love the grey flower popping up from the colourful background! !